One of the first questions you should answer (of course, after answering “Yes!” to your (now) fiance), is the question of whether or not you want to have your wedding at an all-inclusive venue or not. There are pros and cons to both options and a lot to consider. 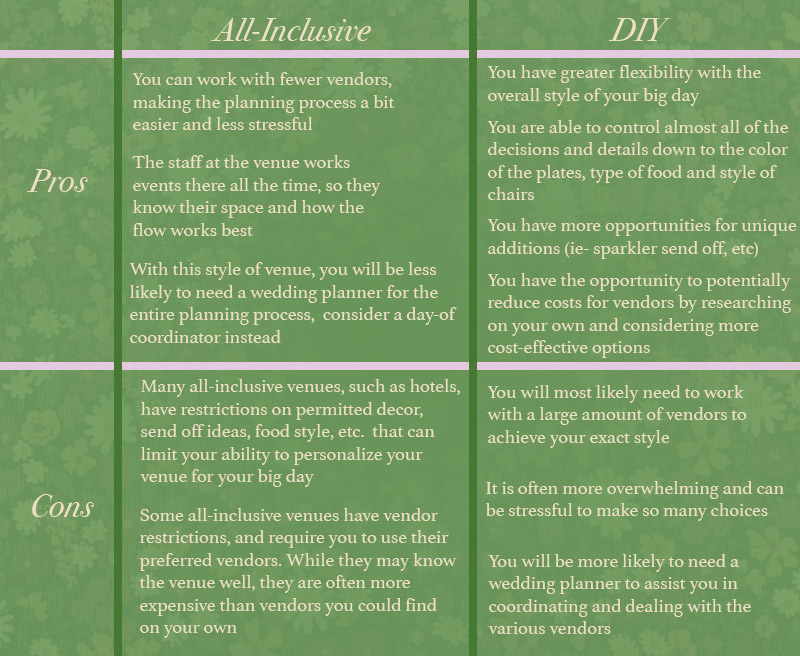 Here are a few points to consider when trying to choose which style venue will fit you best. Are you a bride that would prefer a more traditional venue, such as a hotel ballroom? Are you a bride that does not have a preference on details such as silverware color, plate color, linens, etc? Do you consider yourself a “go with the flow” bride when it comes to the specific decor details of your big day? If you answered yes to the questions above, an all-inclusive venue seems to be a good fit for your big day! Do you want to have control over every aspect of your wedding, including color of linens, style of chairs, type of silverware, etc? Do you have a very specific style and vision that you do not want to stray from down to the smallest details? Are you willing to work and coordinate with many different vendors in order to achieve the specific vision for your big day? If you responded “yes” to any one of these questions above, a venue that allows for complete personalization would be best for you. Need some more help to decide? Take a look at the pros and cons list below! Still not sure what to do? We’re here to help! to let us know how we can help you plan your big day!